Is there a cuisine that you've been curious about and would like to try? Or perhaps you tried a type of cuisine for the first time and it was nothing like you expected? For me, a cuisine I've been interested in trying for quite some time is South African. I've had other African cuisines before and I was curious how South African cuisine would compare, given the influence of the diverse cultures that reside there. Please check back during this week for the above South African recipes! As I've always believed, you can learn a lot about a culture through it's cuisine so come take a culinary adventure to South Africa with me this week. Aside from the delicious meal, we had a chance to learn about South African wines which we paired with dinner. Many believe that South Africa is the up and coming wine region. In the past, South Africa made wines that no one really wanted. But with its constantly improving social conditions, the wine industry there are now ready to show off what they have been doing with wines. South Africa evolved its wine industry very different from other New World wine producers. To set themselves apart, the South Africans invented their own grape. It's called Pinotage and crosses the Pinot Noir and Cinsault grapes. But the dominant grape of any color is Chenin Blanc, sometimes known as Steen. 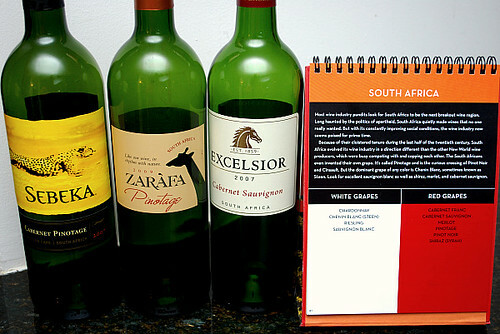 South African have excellent Sauvignon Blanc as well as Shiraz, Merlot and Cabernet Sauvignon wines. Nose - Our 2007 Sebeka Cabernet‐Pinotage is a fruit driven wine that features the blackberry, currant and herbal notes typical of Cabernet along with red fruit, acidity and smoky earth notes typical of Pinotage, South Africa’s signature varietal. Bright, ripe berries and subtle oak flavours of chocolate and mocha promise what is delivered on the palate. Taste - Well structured and beautifully balanced. Attractive notes of fresh red berries are backed by longer lingering dark fruit, all supported by good tannins and the velvety finish of toasted oak. Food Pairings - Perfect companion for rich foods, including fire‐grilled meats and vegetables, or your favorite pasta. Nose - Ripe blackcurrants a plumy fruit. Soft ripe tannins balance toasty oak aromas and sweet fruit flavours. Taste - Good structure with soft, clean finish. Food Pairings - Delightfully versatile, it makes a delicious partner to a variety of foods, including red meats, and rich pasta dishes. Of the above wines we tried, those that prefer the strong, fruit forward wines especially liked the Excelsior Cabernet Sauvignon. Others preferred the balance of the Pinotage. Least liked was the Cabernet Pinotage. Wow! I never knew what South African food consisted of. I'm really wanting to travel there, but I'm sure my tastebuds will travel there first when I try some of these recipes. i plan to check it out. i also want to try that corn/crab soup recipe. it looks pretty easy and delicious. I love South African wines. Unfortunately I have not had any experiences with South African cuisine. I'm looking forward to the recipes this week! Wow! The hazelnut chocolate & cinnamon cookies sound amazing! Recipe please!! I haven't had much South African cuisine but I have had many of the region's wines. Excelsior Cab is actually one of my favorites. It's a big seller at the local marketplace I buy it as well.